Fire extinguishers cannot be used on any flame, and must certainly not be used on a burning pan containing fat. 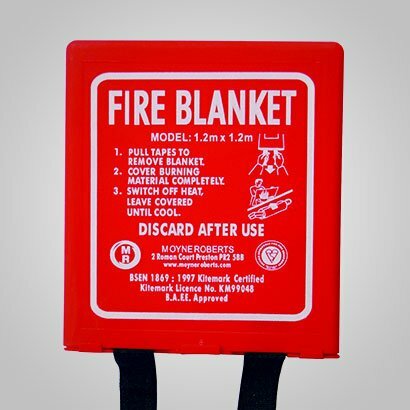 However, the fire blanket is the safest fire control method to have in your kitchen because it can be safely used to smother a pan-fire or to wrap around a person whose clothing is on fire. Do not forget to cover your hands with the blanket itself when using it to put out a fire.